Staff very friendly and helpful, location good, rooms are nice and the grounds are nice. Didn’t eat there so can’t comment on the food. Nice clean room, friendly & efficient staff. Good location (only 20 minutes walk to city centre) Restaurant was good value for a three course set meal. All round a pleasant two night stay. Friendly staff, apart from the chef that couldn't be bothered to make some gravy when we asked for it. I had a great room overlooking the garden on the 2nd floor. Pretty garden, good food, located on a good bus line taking u right into town Overall my favorite stay in my 3 week trip all around England. The hotel appears quite remote when browsing through the different properties available in Exeter. However, the city is very compact and despite what the pictures would indicate, the hotel is reasonably central. The staff are very friendly, there's a sense of locality when you are at the hotel, it doesn't have a cold, corporate sense attached to it. The hotel staff are also very willing to order taxis, etc. The price I received was also the most competitive of all properties I looked at in Exeter, and being there for a conference, I did ask around if people had found any more lucrative hotels, most appeared to be staying at more expensive ones without more services. The young waiter and waitress deserve a medal they tried so hard to please people. OK. Breakfast. OK Supper. Not as good as expected from the photograph of the Hotel or the write up. Clarion Collection Buckerell Lodge This rating is a reflection of how the property compares to the industry standard when it comes to price, facilities and services available. It's based on a self-evaluation by the property. Use this rating to help choose your stay! Set in 4 acres of peaceful, beautifully landscaped grounds, just one mile from the heart of Exeter, Clarion Collection Buckerell Lodge provides the perfect combination of seclusion and convenient city access. 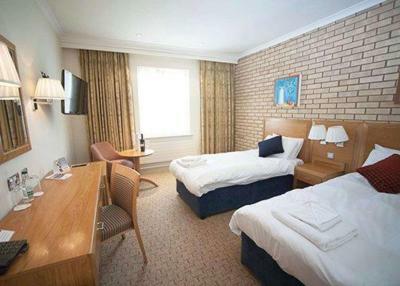 Less than 5 miles from Exeter International Airport, the hotel is less than 30 minutes drive from the spectacular natural beauty of Dartmoor and the areas lovely beaches. The great location, close to Exeter city center, makes the hotel a great venue for a wide range of events including meetings and conferences, private dining and formal receptions. There are plenty of historic buildings to visit in the region, including the city's famous cathedral. Powderham Castle, one of Britain's best-known stately homes, is nearby and there are several National Trust properties in the vicinity, including Castle Drogo and Killerton House and Gardens, as well as the Crealy Park, ideal for families or the Bicton Park and Knightshayes Court. Clarion Collection Buckerell Lodge was a 2008 finalist in the South West Tourist Authority, Business Tourism Excellence Awards. 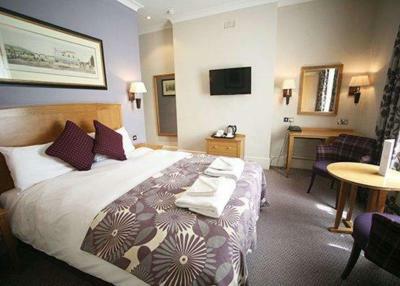 When would you like to stay at Clarion Collection Buckerell Lodge? House Rules Clarion Collection Buckerell Lodge takes special requests – add in the next step! Clarion Collection Buckerell Lodge accepts these cards and reserves the right to temporarily hold an amount prior to arrival. Please enter requests for extra child beds and/or cots, noting the age of the child in the comments box when booking. Reservations for 6 or more rooms made under the same name and for the same arrival date will be classed as a group booking and may require a deposit or full pre-payment before the date of arrival. The hotel does not accept pets, with the exception of service animals. Please note that during spring and summer there may be a wedding party in the hotel at weekends. It took 20+ minutes to check in as the receptionist had disappeared. Kept running out of things at breakfast not enough staff. Food at party rubbish. Unfortunately, the rooms need sprucing up, painting, extra cleaning of all doors, etc. However, with the right investment in improving the main Reception Rooms, the hotel could be magnificient. I would start with painting out all the dark wood which ruined the ambience of the property. The staff were all excellent, especially the lovely young waitress in the restaurant. She couldn't do enough for us! Food was amazing. I am vegan and the curry the chef prepared was first rate, excellent. Not very good sound proofing. We could hear people who were talking in the corridor. Great sized room with lovely restaurant and setting. Comfy bed! As far as he told me nothing disappointed him! It was actually my brother who stayed here and both him and his friend have learning disabilities. The staff here were very friendly too him and as what my brother has told me, went above and beyond the requirements. This made my brother's stay very good and enjoyable here and cant wait to go back here again! Self service breakfast was adequate but items quickly ran out. This was due to staff member being absent. Clean and tidy but will probably need a refurbishment in next 5 years. Spacious en suite and room. Friendly staff. Excellent location and grounds. The staff were friendly and helpful. The food was good. Rooms clean and comfortable. Perfect! Comfortable, clean and a great price! The only thing I would say is that the rooms are very hot and stuffy, with the heating switched off. They’re obviously aware as I’ve stayed in 2 rooms now, hot in both and each had a desk fan to try and help. However it doesn’t cool anything down much & we needed it on all night which was very noisy so we didn’t sleep well either time we stayed. Beds ok but a little hard. The room was very hot, but luckily there was a fan in the room and we were able to open the door. A lovely property, very peaceful with nice gardens. We were given a garden room which was lovely as you could open the french doors onto the garden. Excellent value for money and a good sized room and lovely en suite. Breakfast overpriced,didn’t particularly enjoy...£10 or £12.50 if u dnt book!!! Not great. Clean,friendly and good value for money. A short bus ride into town. Staff very friendly and helpful.